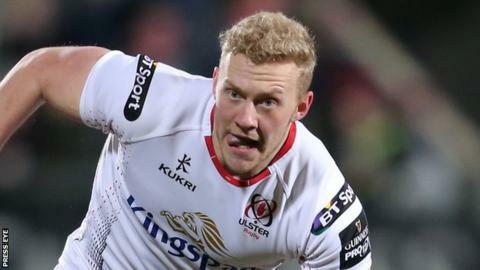 Ulster centre Stuart Olding has signed a contract extension which will keep him at the Kingspan Stadium until the end of the 2018/19 season. Olding made his debut in December 2011 but has only made 39 appearances because of two lengthy spells out with serious knee injuries. He returned to action against Treviso in January, scoring a bonus point try. Ulster boss Les Kiss described Olding as one of the most talented players he had worked with. "This is a huge boost to us. Stuart has worked incredibly hard to come back from injury and is starting to recapture some of his best form," added the club's Director of Rugby. "The determination he has shown in returning from his most recent injury speaks volumes about him and he is exactly the type of person we need in the squad." Kiss was interim Ireland coach when Olding made his international debut during the North American tour in 2013. Olding earned a second cap the following year, against Georgia, and marked the occasion with his first international try.